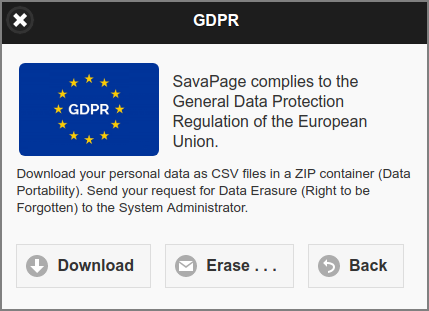 This dialog is shown when the GDPR button is pressed from the SafePages top bar action menu, the Transaction List or the Document List. See Section 16.2.1, “Data Portability” and Section 16.2.2, “Data Erasure”. Enable the User Web App GDPR Dialog: Y (default) or N.
Optional email address for GDPR Data Erasure requests.